Design and design thinking has an important role to play in the creation of new products and services, as well as an integral role in enabling innovation within companies. The benefits of a design approach at the initial stage of product innovation is often key to a successful outcome. Providing companies with an opportunity to increase productivity and create value in products and services in both traditional and emerging sectors. Enterprise Ireland’s Technology Gateway Network aims to highlight the importance and value of design within the innovation process, the benefits of engaging with a design process and the role that design implemented innovation can play in the success of Irish businesses. Many of our Gateways, in a variety of specialisations and industries, offer a design-led approach when collaborating with Irish companies. With this in mind, the Technology Gateway Network and USER-FACTOR Design for SMEs group are co-hosting a networking morning on 30th April 2019 at the Carlton Dublin Airport Hotel (9 am – 12 pm). 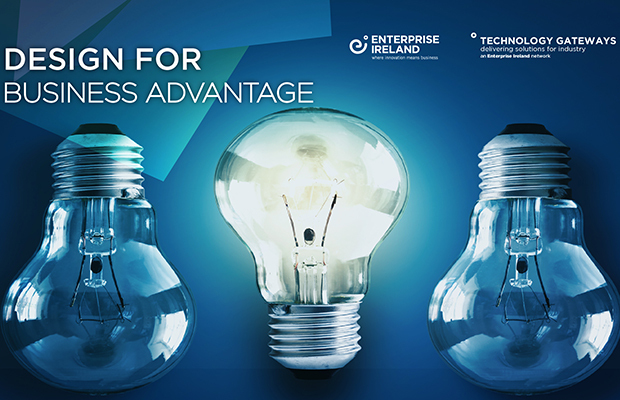 The theme of the event will be Design for Business Advantage and participants will hear from a number of companies who have worked with the Technology Gateway Network to use the expertise available within the host Institutes of Technology. The keynote address will be given by Lorna Ross, who has had a stellar design career which has also been an interesting journey spanning more than 25 years, with stops in the world of fashion, wearable technology and, most recently, health care. She is a futurist at heart, recognised for her ability to anticipate shifts in the social, cultural and economic context for design. She was one of the pioneering researchers to focus on wearable technologies and built a reputation for research activity in this arena. She founded and led the Human Wellbeing Group at the MIT Media Lab, where her vision was to employ human-centred design principles to address the biggest challenges facing the healthcare industry in delivering population health outcomes. Representatives from our Technology Gateways, including the managers and their research staff, will also be available for informal meetings on the day. If you wish to avail of this option, please contact Grainne Foley (gfoley@technologygateway.ie) or Megan.Reid@Enterprise-Ireland.com. This event is suitable for all types of Irish Business such as Start-Ups, SMEs, large indigenous companies and multinationals. A networking lunch will be provided from 12 pm. Registration for this free event is available here.